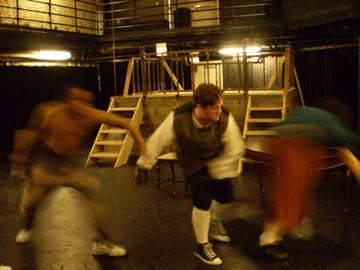 Fellow Bloody Bess cast member Adam Hinkle took this photo of me during fight call last week. I look pretty badass, if I do say so myself. I assure you that we are not wearing Chuck Taylors in the show. We have our first audience tonight, and officially open tomorrow. Holy crap. Gotta say, that pic is pretty awesome. THWAP.